After the April showers come May flowers, which means the summer wedding season will soon be in full swing. Tying the knot is an exhilarating experience but planning your nuptials can leave you feeling frazzled, especially if you’re worried about going over your budget. With the average cost of a wedding hovering around $30,000 it pays to look for ways to keep your costs down. Fortunately, Uncle Sam makes getting hitched more affordable by allowing couples to claim deductions for certain expenses. 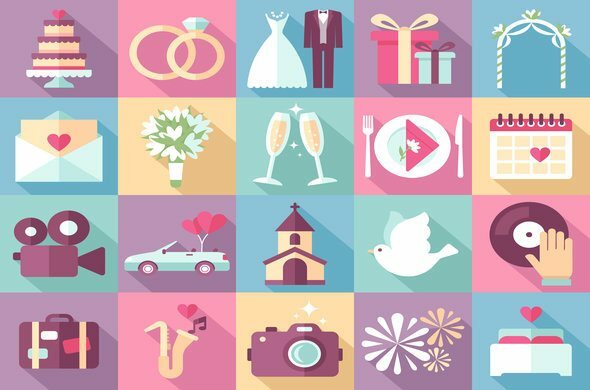 If you’re walking down the aisle this spring or summer, below you’ll find a few things you may be able to write off on your taxes. Unless you’re planning a backyard wedding, you’ll likely have to pay a fee to secure the church or other venue for the big day. For example, if you’re getting married at your church, you may be asked to pay a ceremony fee. This fee may be deductible if it’s considered a charitable donation. If not, you could still score a tax break by making a larger donation in exchange for a waiver of the fee. As long as the place of worship you choose meets the criteria for a tax-exempt organization, the donation should be deductible. You may also be able to write off the fees if you hold the ceremony at a non-profit venue, such as a museum, state or national park or another historical site. Any fees you pay may be categorized as a deductible charitable donation but the site must meet the IRS tax-exempt guidelines. Just keep in mind that any fees or tips you pay to individuals, such as the officiant, don’t qualify for a tax deduction. 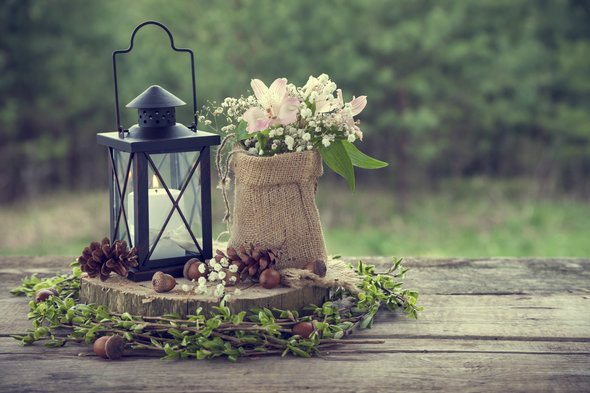 Things like centerpieces, candles and flowers can put the finishing touches on your dream wedding but what do you do with them once the reception’s over? If you don’t have room in your closet for 500 tea lights or dozens of glass vases consider donating them to your local Goodwill or Salvation Army. Under the IRS guidelines, you can write it off as a donation up to the fair market value of the items. Just make sure you get a receipt, especially if you’re dropping off several hundred dollars’ worth of wedding gear. Those bouquets of roses or hydrangeas can also be donated to a local charity, such as a women’s shelter or another non-profit. Not only will someone else get to enjoy their beauty before they begin to wilt, you’ll be able to claim the contribution on your taxes. One of the biggest expenses associated with planning a wedding is the food. While it’s always better to have more than you need rather than come up short, you could literally be throwing money in the trash if you end up dumping the leftovers. Donating those extra hors d’oeuvres or a few trays of chicken wings to a local soup kitchen or homeless shelter cuts down on waste and allows you to help those in need while taking advantage of a tax break. If you’re planning to donate any extra food items from the wedding to charity, make sure you coordinate with your caterer and the receiving organization beforehand. If you just show up with a carload of food, your donation may be turned away so you want to get approval prior to the big day. For the bride-to-be, choosing the perfect dress is one of the most important aspects of planning a wedding. While it can be tempting to spend thousands on a gown, it could be a waste if it’ll eventually end up in the back of your closet collecting dust. Unless you want to hold on to it so you can pass it down to your daughter one day, it may be worthwhile to consider donating it. Organizations such as Brides for a Cause and Brides Against Breast Cancer accept donations of used wedding gowns as well as accessories, including veils, tiaras, slips and headpieces. These organizations sell the gowns and use the proceeds to fund charitable causes. If your bridesmaids aren’t crazy about their fuschia chiffon concoctions, you can also donate them to The Princess Project or a similar non-profit which re-purposes the gowns to provide prom dresses for high school students who otherwise couldn’t afford them. These are just a few of the wedding-related expenses newlyweds may be able to deduct at tax time. If you’re planning on snagging any of these write-offs, be sure to get the proper documentation to prove your claim. The IRS has specific guidelines about what you can and can’t deduct so you need to make sure you’re prepared. As you stomach the seemingly astronomical costs of a wedding, take solace in the fact that there may be a few things you can write off on your taxes. Especially if you’re operating on a tight budget, this can make a big difference. And remember, if you want additional guidance on your tax write-offs or wedding budget, use SmartAsset’s financial advisor matching tool to find a financial expert to consult. First you’ll answer a series of questions about your situation and your goals. Then the program will match you with up to three advisors who meet your needs. You can then read their profiles to learn more about them, interview them on the phone or in person and choose who to work with in the future. This allows you to find a good fit while doing much of the hard work for you, allowing you to focus on your wedding.